Now before you get all offended… there is a very specific context to this comment. It echoed something mentioned earlier in the day by Stuart, when asked why Inver House decided to enter the Indian market in 2015. “Basically we’ve seen people trading up. Ten years ago it would have been the cheaper and mixed products that people were drinking. That was down to affordability, the price point. Obviously now foreign travel is a lot more common. And they come back and bring back whisky – a nice status symbol. “They start getting more interested in the different flavour profiles, they want to try something different, they want to entertain their guests. Single malt drinkers have more than one brand. As opposed to blended product where people tend to be very loyal to a particular brand. The single malt adventurer infects a loyal local blend drinker into the dangerous world of illicit relationships with an imported single malt! And from such exposure, the desire to acquire extends to duty-free airports at ‘home’ or perhaps eventually from the local ‘wine’ shop. So while blend drinkers are a loyal lot who for years, nay decades, stick to their Black Label, Teachers, Blenders Pride, those who have strayed down the path of single malts are always itching to explore, make that next remarkable whisky discovery! I was again reminded of this when a fellow whisky explorer requested ideas for acquiring more miniatures… to add to his growing collection of different sets… already at 14, he added another 20 during his latest London jaunt. So far we have explored the Tomintoul trio, four more minis in August, another set in September… and yet another mini session planned next week! Would you agree? Are single malt sippers incapable of fidelity and always seek the novelty of something ‘new’ in their quest for the next great whisky? When the Hazelwood series first came out, I couldn’t help but be struck by the rather attractive packaging and decidedly art deco style. A little pricey for a 500 ml bottle, I passed it up a few times at duty free. From William Grant & Sons, the Hazelwood blended whisky series was created to honour William Grant’s granddaughter Janet Sheed Roberts, after her Hazelwood house, full of art deco items, near their Glenfiddich distillery. Overall it is exceedingly easy to drink. Jokingly it was described as quite a ‘homely’ whisky. One could even say ‘charming’. There is a danger in attributing gender to a whisky, but this one certainly seems to be trying to appeal to women. House of Hazelwood 21 Year Old is inspired by the sultry beauty of Mumbai in the 1920s. This release represents a bolder, somewhat spicier and more robust whisky balanced to perfection by the ageing of some of its malts for 21 years in sherry casks made of European oak. NOSE: Dried fruits and spice dominate, alongside a sticky sweetness reminiscent of rich fruit cake. A splash of water alters the balance and adds complexity with a subtle hint of tobacco leaf. TASTE: Cinnamon, cloves and woody spice, with a dry finish. Water accentuates the sherry cask influence, bringing out the sweet oiliness of treacle, dates and polished leather. FINISH: Spice, Molasses, and Resin. Farewell gifts… and fare thee well my friend! 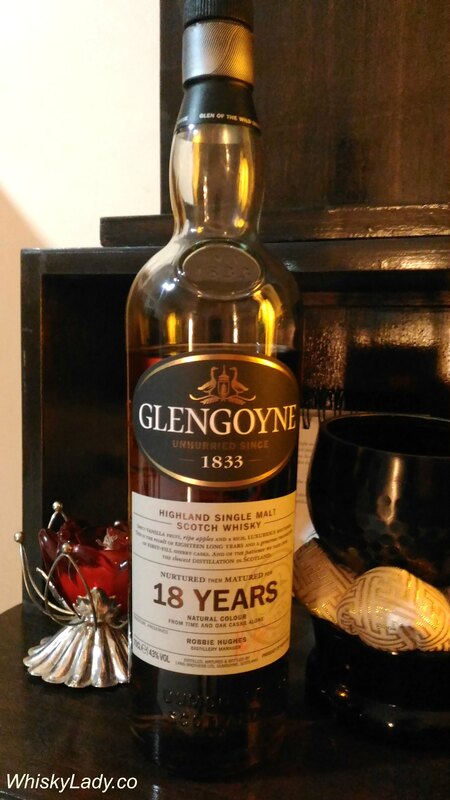 Glengoyne is one of those well regarded distilleries with a distinctive sherry berry quality. Our original Mumbai whisky tasting group has sampled both a 12 and 21 year during sessions I either missed (or missed taking notes). I did encounter a Glengoyne 21 year at an ‘adult whisky evening‘ however it was curiously off, so likely not representative. 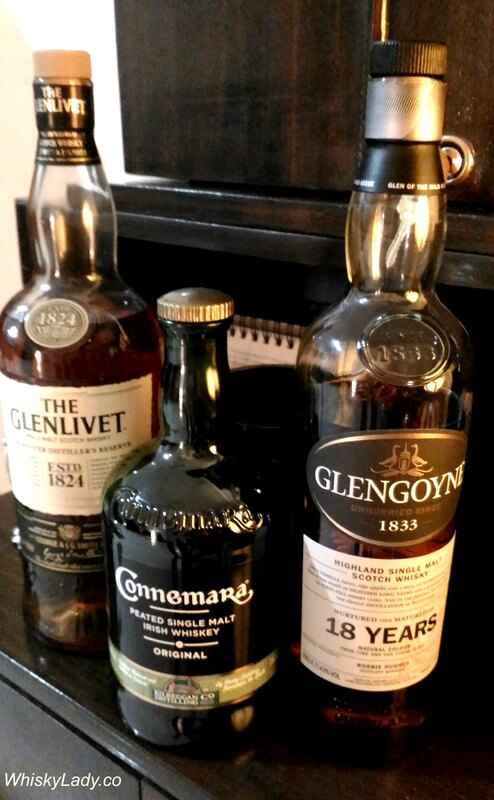 For our October session, our host was careful to ensure that while we may have sampled Glengoyne whiskies previously, what we opened that evening would be a different age statement than we had tasted together before. Overall we found this whisky very accessible, good aromas and gave the impression of being not fully sherry but perhaps a mix of 1st fill sherry with other casks, nicely rounding out the elements so the sherry dimension was not overpowering or too intense. In short, it was sherry but… not. Which worked! For those of us who drained to the last drop (seemed to be all! ), we were impressed by the excellent aromas remaining in the empty Glencairn glass. For most, this was the whisky of the night! Nose – Awash with red apple and ripe melon. Heavenly and well rounded, it drifts into hot porridge topped with brown sugar. Taste – Full bodied, round and rich. At first macerated fruits, marzipan and walnuts; then warm spices, dry cocoa and lingering Seville marmalade. Finish – Long, warm and dry. What else did we try in our October session? 1st up in our original Mumbai whisky tasting group‘s October session was a no age statement dram from Ireland. 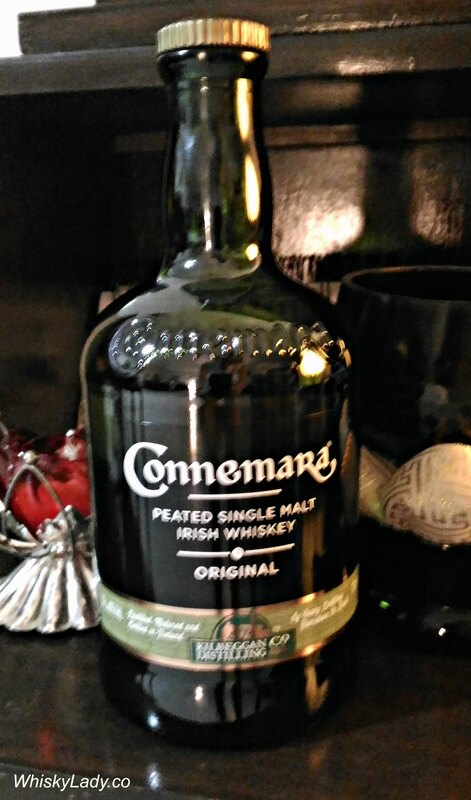 Unlike most Irish whiskies, Connemara uses peat, hence it was an interesting choice to start the evening with. We sampled it blind, the bottle freshly opened, and didn’t know what to expect! Overall we found it relatively thin, so assumed it must be 40%, no more. While it lacked depth, there was an oily quality which gave it some character. Now here is the thing… there was a bit of a debate on the peat element. One of our members simply did not get a trace of peat whereas others found hints, but not a clear stamp. During the reveal there was surprise. Those familiar with this whisky recalled a much more direct “in your face” type peat, not this gentle tease. Leading to speculation that perhaps Connemara has been tinkering with the recipe? Or something else what at work? After sampling all three whiskies for the evening, we returned to the Connemara to see if we could solve the perplexing peat question. This time, when another glass was poured, instant recognition of peat. Now… was it in contrast with the Glenlivet? Did we not all have our peat detectors fully switched on with the initial go? Or did it need time to fully reveal its peaty character? While it still did not have a strong peat quality, there was no doubt it did indeed have some peat. Another from the tasting archives… This time the post is truly a ‘blast from the past’ – Oct 2011. This month we were back to our standard format and blind tasted before revealing the whisky. The session featured: Glenlivet Nadurra, Scapa 16 yr, Mitcher’s Straight Rye, Kilchoman Spring release followed by an extra treat Caroni 18 yr rum. It was an exceptionally lovely evening in Worli with perfect hosts. A comfortable setting, the right music, glasses, spitoon and cucumbers all laid out, followed by the most fabulous nibbles… yum! The contrast between the different single malts was also a wonderful learning experience… which was, naturally, the real focus of our evening. Glenlivet Nadurra 16 years – Batch 1010K Bottled 10/10. Cask Strength 54.9%. Non Chill Filtered. Wood – not stated. The legs were slow though closely spaced, colour bright gold. The nose was sweet with a hint of honey, grass, a little “woody”. Not off to a bad start… and then we sipped, spit and then sipped and swallowed. While not ‘knock me down’ harsh, the first hit definitely had an edge. Spicy was a word bantered around a bit. The finish was also… well.. not so impressive. 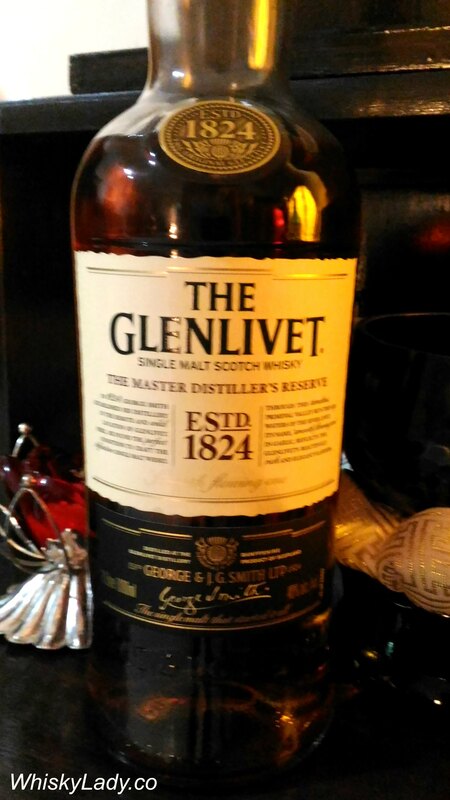 Our overall conclusion was this perhaps wasn’t a keeper… Unveiled we were surprised this is one of the few Glenlivet’s non-chill filtered considered to be ‘good’. The distillers notes included words like ‘fruity’?! Puzzled, we chocked it up to a mass production distillery and moved on… til somewhere along the way a discussion about ambient temperature in Scotland vs India with an impact on flavour led to an inspired idea – why not chill the Nadurra and see if it makes any difference? PS The debate on alcohol strength was lost by all thinking it was lower than 54.9%. Scapa 16 years 40%. Wood not stated. The legs were broad and a little faster than the Nadurra. The nose was certainly also sweet, with a more pronounced heather honey aroma than the bolder Nadurra. First savour was clean, was there a teasing hint of peat? Perhaps a little of the ocean? Neat was clearly best – any dilution simply detracted from its gentle dance on our palates. The finish wasn’t notable however this Oarkney Islands contribution was deemed light, lovely every day enjoyable. Scapa is slightly ‘cultish’ whiskey and we were a bit disappointed about such limited details on its maturation process. Mitcher’s Straight Rye 10 years 46.4%. Wood – Charred White Oak, Single Barrel. What a contrast to go from the Scapa to a Rye… Colour very dark – distinctly so. 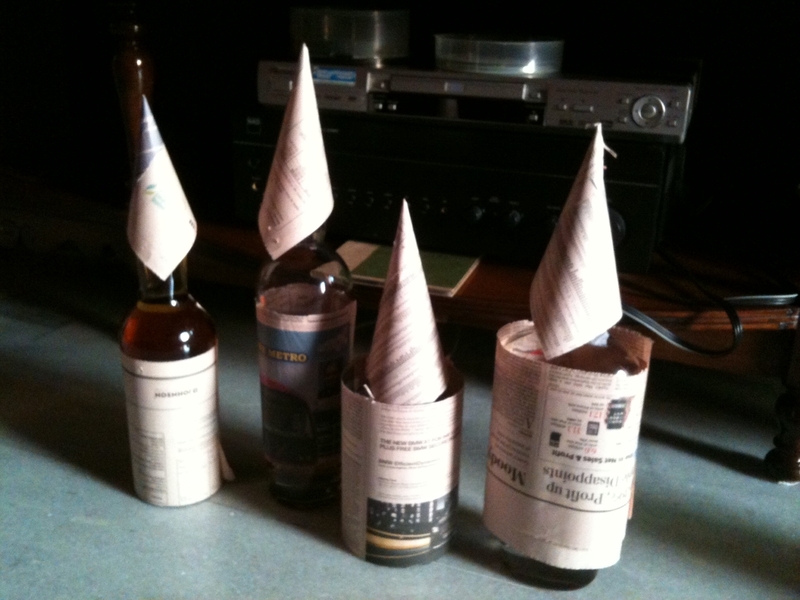 The notes were apple pie… comments were that it is non-whisky or almost wine-like. Our first American offering, it was a fabulous addition to our tasting journey. We learned later is that this is quite a rare bottle with the Mitchers team’s comment “You have tried one of our best!” Lucky us! Kilchoman Spring 2011 release 46%. Age not stated – estimate 3 years. Caramel notes… In your face peaty… smokiness of a cigar or pipe. Adding water transformed it – toned down the peatiness and opened up the whisky. Then some fruity flavours emerged with a nice lingering smoky finish. The surprise post unveiling is that it was quite sophisticated for what we understand is only a three-year old from Islay region. For a few, the Kilchoman Spring 2011 release was the clear favourite. We also experimented by adding a twist of a mosambi peel. What an exceptional combination! Now back to the Nadurra… Was it the booze in our collective systems, or just residual disappointment from our earlier quaffing? All one can say is there does indeed seem to be a clear correlation between temperature and taste. Cooled – the Nadurra was a delight! The earlier harshness was chilled into submission, allowing the fruity flavours in the distillery’s tasting notes to actually emerge. Our evening closed with a little ‘extra’… not a whisky but instead a remarkable rum – yum yum! Caroni 18 years 55%, Heavy Trinidad Rum. Another special surprise our host pulled out of his marvellous liquor cabinet was a Caroni. Clearly no ordinary offering, it was rich, layered, full of flavours and soooo smooth going down. The alcohol content was deceptively much higher than it seemed – so one to add caution if doing more than sampling! It is also a fascinating story of an Italian so passionate about this rum that he bought the entire distillery just to not be deprived of his favoured Trinidad rum. The packaging is also superbly stylized. Naturally we also added a hint of mosambi to this too… mmm mmm good! Anyone have other comments on these whiskies and rum? This wasn’t our first flirtation with American whiskies… nope we had an earlier evening combining some whisky standards in cocktails. However that night there was only one American single malt (Hudson). For this evening, we planned three whiskies which somehow morphed into five bottles and a jar – funny how that happens with these ladies! 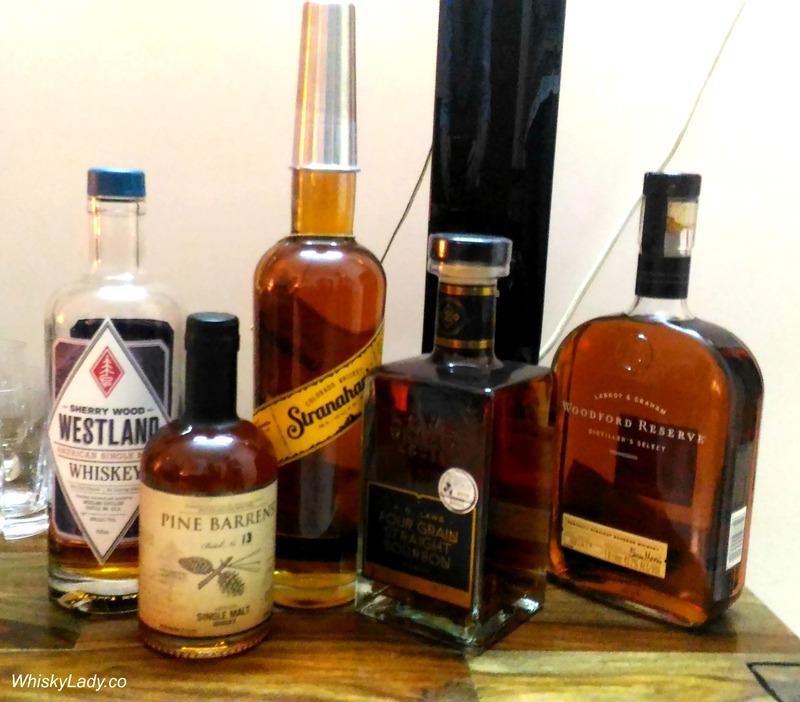 The Whisky Ladies debated the whisky tasting order for our American adventures and finally decided to split the evening between single malts – moonshine – bourbons. Then came the question of which whisky to start our evening off with… given Pine Barrens is known for being geared towards beer drinkers, we thought it a rather fitting start! From there we moved on to Colorado’s Stranahan’s which… ahem… reminded us why we don’t tend to be big American whisky fans. Followed by the lovely Westland Sherry which reminded us to stop being such whisky snobs and simply enjoy a good dram! Break time with the Ole Smoky – dutifully drunk straight from the jar. It felt like we were channeling our inner “Mellie” Grant with her moonshine stashes all over the White House (Scandal). Then we cracked open the AD Laws Four Grain Straight Bourbon, pronouncing it rather yummy, partly as it isn’t a typical bourbon. And finally closed our evening with a proper bourbon – the Woodford Reserve. Do also check out the new North American whiskies page! 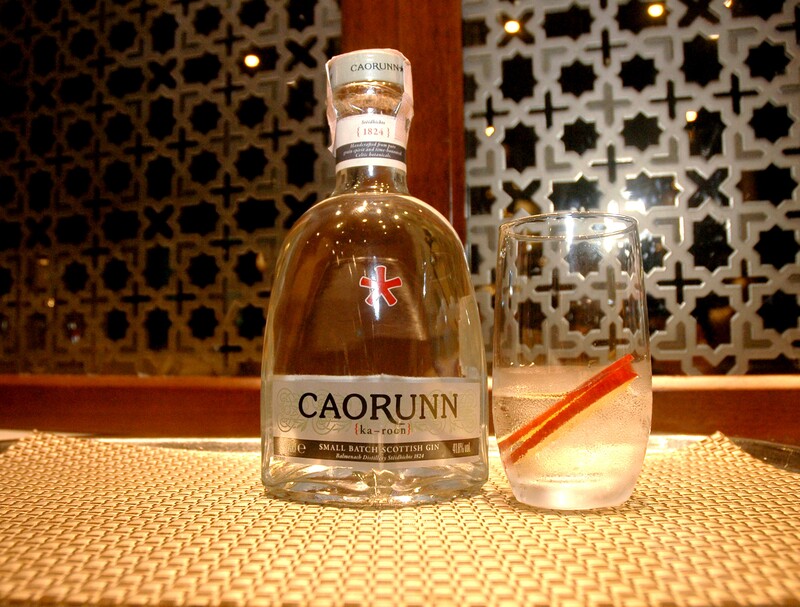 Caorunn Gin… Beat the Mumbai heat! Yes this is a whisky blog. However I did warn that from time to time another tipple or two may make an appearance. And I think we CAN make an exception for this gin – given that it is made at a malt distillery – Balmanech. In all cases, it was served with an apple and an equal portion of tonic to gin. Perfection! Bright, light, highly refreshing. Delicate notes. As Karen shared, the five points of the red star bring together the Caorunn gin elements – bog myrtle, rowan berry, heather, coul blush apple, dandelion. Yet since then… only a whiff in Winnipeg’s liquor mart. Til today! 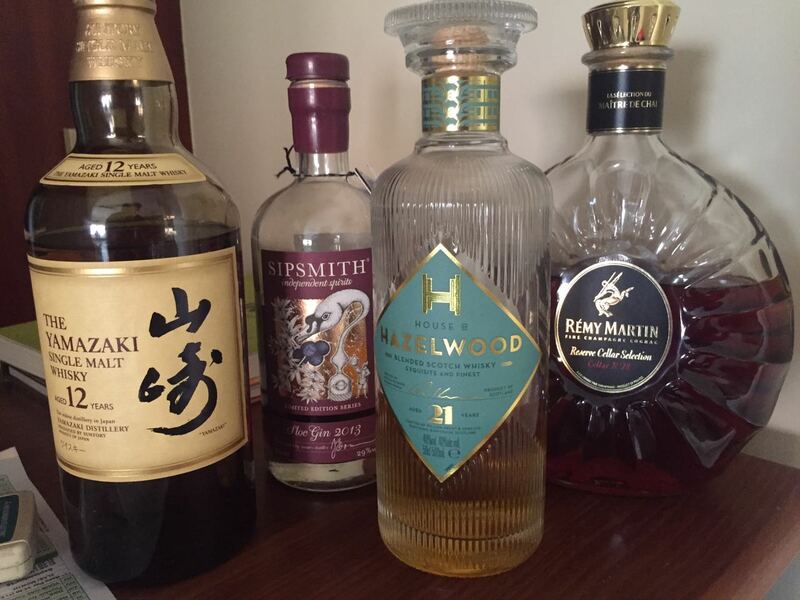 Thanks to my partner’s recent trip to London, our liquor cabinet is graced by our very own bottle. As Mumbai’s 2nd summer comes upon us, temperatures rise, a chilled G&T or other assorted beverages seem just right! Oh happy days! Last in our Bombay Malt & Cigar club’s blind tasting surprise evening was an unusual dram. Clearly cask strength, clearly different… it was definitely an interesting close to the tasting portion of our evening.. to then shift gears to desi street food snacks and fine cigars. The nose was really quite promising but the palate was simply flat and disappointing. Like pricking a balloon letting all the air out… just simply didn’t even come close to matching the aroma. We gave it more time. Wet rag, malt and more raisins joined the aromas. The palate? Still lacklustre. We added water. Sugar sweet. This was a difficult dram. Definitely different however not an easy one to get to know. Our efforts to speculate what it could be fell as flat as the palate. We just couldn’t figure it out. 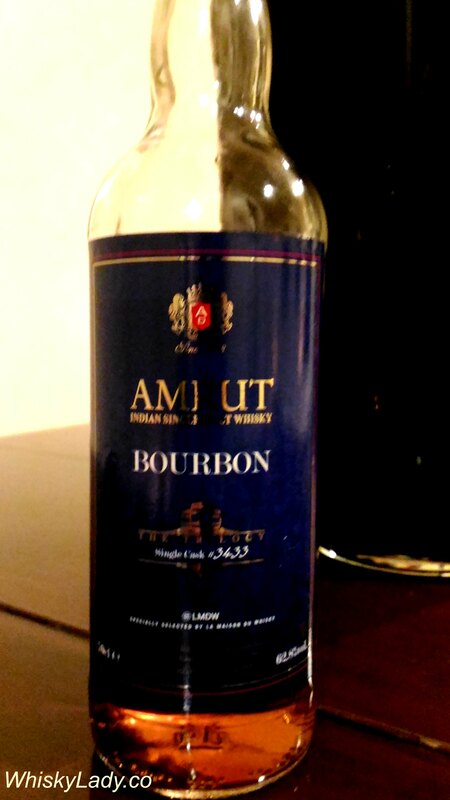 Though perhaps someone tossed Amrut out simply as our whisky curator is an Amrut fan. With the reveal… surprise. Particularly at the strength! “Can a whisky even have an alcohol strength like 62.8%? ?” Leading to discussion of another of our curators favourites – Aberlour with their cask strength A’bunadh sometimes coming above 60%. With the Old Pulteney, we had a clear classic. A terrific start and clearly a whisky to simply enjoy. With the Westland, you could picture curling up with a warm fire or lighting up a cigar and whiling away the evening, chatting with friends, sharing a laugh or two or three! This Amrut Bourbon forms part of a trilogy exploring different effects of peat – all at cask strength. Unpredictable and surprising, this unpeated Amrut draws on both malted barley and a perfectly integrated woodiness to express every facet of its personality with great lyricism. With an exotic character overflowing with freshness, it also shows itself to be particularly spicy and vanilla-tinged. Alongside its two peated “sisters” released in our 2016 Collection, they form a trilogy that will mark a milestone in history of the Bangalore distillery. Appearance : Burnished gold tinged with orange. Nose : Full-bodied, firm. Majestic malted barley takes centre stage in the aromatic palette. It is accompanied by vanilla, nuts (walnut), strong spices (curry), flowers (lily, iris, lavender) and exotic fruit (pineapple, banana). Gradually, noble wood essences bring out the exceptional quality of its woody character. Palate : Dense, complex. The palate counterbalances the rigour of the nose with a remarkably liberal style. It offers numerous gustatory paths, each as intense as the next. Vanilla acts as a base for fresh and exotic fruits, aromatic plants (vervain, camomile), spices (turmeric, star anise) and white spring flowers (lily of the valley, lilac). Overall : Long, almost never-ending. Without losing any of its exotic character, the finish develops with aromas of liquorice and cocoa powder. The spices become increasingly hot and the fruit bursts with sweetness. Like the nose, it has a phenomenal, superb woodiness. Thirst-quenching retro-nasal olfaction fills the taste buds with the delicious juice of blood oranges. The empty glass leaves a noble spiciness (saffron).